XYZ Integrated Computer Desk | OhGizmo! By Evan Ackerman on 05/29/08 • Leave a comment! Desktop computers are one of those things that are generally great in concept but poor in execution. What I mean is, designing a computer that’s easy to access and upgrade is a super idea, but why does it then follow that said computer must take the form of an off-beige monolith? There are always exceptions, of course, but the tower PC is long overdue for a makeover. 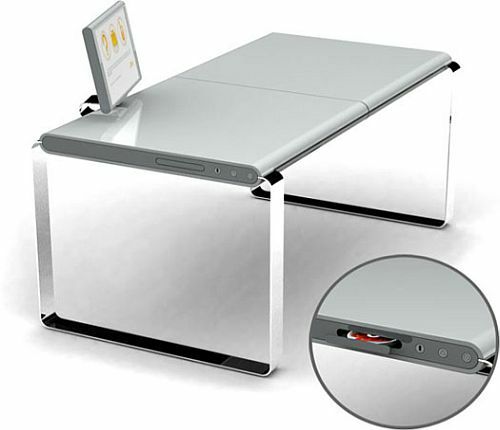 The XYZ Computer Desk blends the expandability of a conventional computer with the usability and good looks of, well, a desk. All of the electronic components and cabling are tucked away neatly inside the interior of the desk, with just a few ports and an optical drive on the edge to give them away. Time to upgrade? No problem, just open up the desk and everything’s laid out right in front of you. I imagine that there’s likely TONS of space inside the desk, and as such, each component probably keeps cooler, runs quieter, and lasts longer. I mean, take a look under your desk right now. Besides your legs, it’s all wasted space! XYZ says that they “designed” this desk/computer, but there aren’t any specifics on whether or not it in fact exists.